There's one civilization that I have not yet covered in my Brave New World strategies series that did receive an explicit rewrite of its unique national ability. I haven't covered them yet because that rewrite isn't so much a change to their ability, as it is really just a clarification that the ability applies to the new rules. 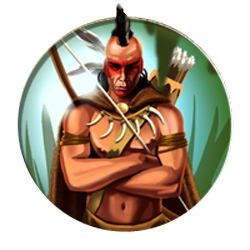 The Iroquois civilization led by Chief Hiawatha has an ability that explicitly utilizes the expansion's trade route mechanics. The Iroquois are another civilization (like India) that receives a lot of hate from the Civ V gaming community due to some supposedly lackluster, highly-situational uniques. This strategy will focus on utilizing those uniques when they are beneficial, and on compensating for their downfalls and limitations. Very little is known about the early history of Iroquoian people prior to the arrival of Europeans in the Americas. The Native American tribes had no written language, and their histories were passed down through oral tradition. According to that tradition, a great Peacemaker united the eastern Great Lakes tribes of the Mohawk, Oneida, Onandaga, Cayauga, and Seneca sometime between the 12th and 15th centuries. Other tribes would later join the confederacy, including some that were displaced from their native lands by European settlers. Iroquois culture was matrilineal, meaning that children were born into the mother's family, and women had a great deal of influence in the politics of the tribes. The Iroquois Confederacy utilized a representative system in which each tribe appointed a number of chiefs (based on relative population of the respective tribes) to serve on a council. There was both a council of male chiefs, and also a council of clan mothers that both had roughly equal authority. Hiawatha is a near-mythical figure in Iroquois history. He was a follower of the Great Peacemaker, who traveled between the various tribes of the region preaching a prophecy of a strong alliance uniting all the tribes of the Great Lakes region in peace. Hiawatha, along with the Peacemaker, effectively founded the Iroquois Confederacy using his skills as an orator (and, in some traditions, magic) to convince the various tribes to join. According to oral tradition, the Seneca resisted the alliance, leading to a confrontation that was stopped when the sun miraculously went dark, turning day into night. This supposed solar eclipse lead the Seneca to put down their arms and commit themselves to the alliance.